The product card represents the products / services of the organization. The product card displays all of the information about the product / service and includes the measures, scale, selling price, inventory requirements etc. 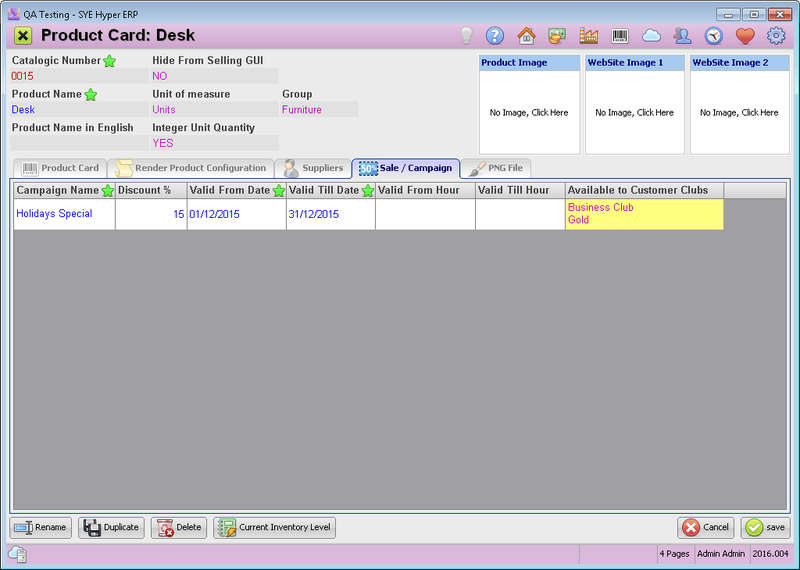 The product card can be opened by double clicking on an exist product record. This window will also be displayed when creating a new product. The product card is used for defining the product and its parts, as well as for the pricing and the inventory reports. These details are required for creating price offers, orders and tax invoices. The products will be available for the users from the products list and from the products catalog. Changing the attributes and definitions of a product / service, is available only from the product card. Changing the measures and scale of a product, is allowed during the sale process, for products with available selection of measures range. 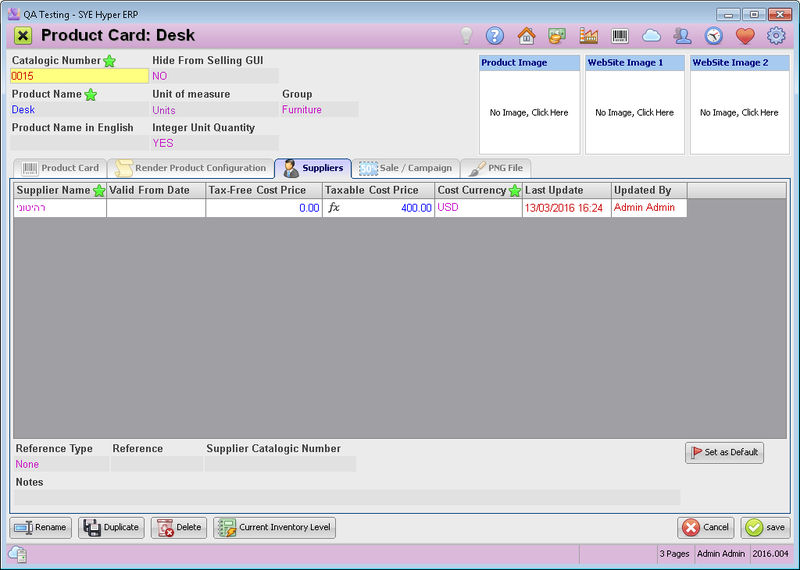 Catalogic Number Unique ID number for the product / service, defined by the user. Hide From Selling GUI Choose yes if you wish to hide the product. The hidden product can not be selected in price offers and orders. Product Name The product / service name, as will be displayed in the products list and catalog. Unit of Measure Select the unit of measure for the product. Group Select the group of products / services to relate this product to. Product Image Hyper allows to add an image for any product, to be displayed in the catalog of products and on the web site. Product Card - The information fields of this tab are used to describe and define the product and includes its measures, prices and inventory definitions. For further information, please read the next section. Render Product Configuration - Create and edit product tree, for products that require assemble of other items and parts. For further information click here. Suppliers - displays the list of available suppliers for this product and the cost prices. For further information click here. Sale / Campaign - Create a campaign for the product. For further information click here. This is the primary tab in this window. In this tab, define the product details and price. These details will be displayed when choosing to add the products to price offer or order. Some of the details can be modified when choosing to add this product to an order, according to the users / clients needs and requirements. Product measures Width, Height, Depth and Weight. Allow to change Width / Height / Depth In order to allow the client to choose the required measures of the product from a given options, fill in the suggested measures and use comma (,) to separate the values. Cost Price The product costs for the organization. If the there is any defined supplier for this product, the supplier's cost price will be automatically filled in this field. Selling Price Fill in the Tax-Free Selling Price / Taxable Selling price, as will be displayed and defined in each price offer or order of this product. Cost / Selling Currency Define the currencies for the cost / selling prices. PP&C Handling Type Define the product handling type (product type / service). 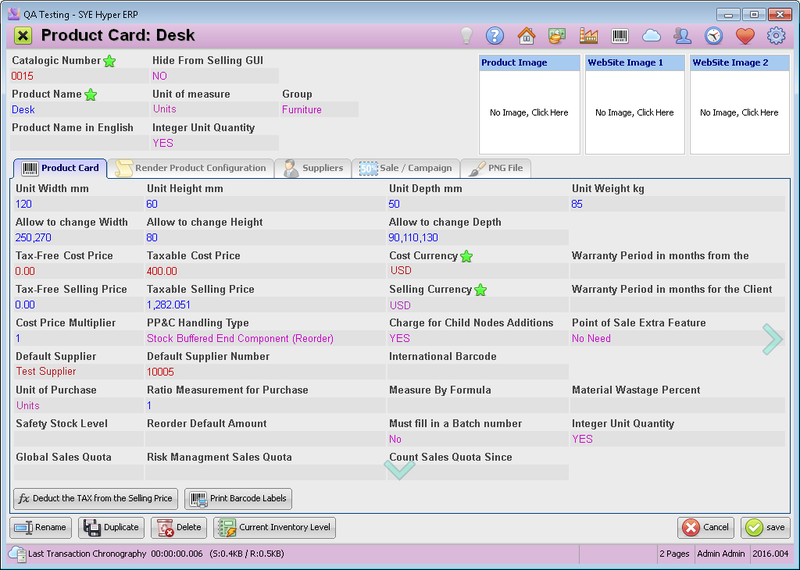 Point of Sale Extra Features Select whether the product price is obligated to weighing. This field also allows to define a manually pricing. When choosing "The product is Pricing Manually", the tax deduction option will be available for this product when creating a tax invoice. Default Supplier The default supplier of this product (as will be described below). The cost prices will be automatically filled according to the defined supplier. Deduct the TAX from the selling price. Deduct the tax from the defined taxable selling price. Print barcode labels for the product. This button allows the user to modify the Catalogic Number of the product. Copy the details from this product card to a new product card. After choosing this option, fill in a new catalogic number for the new product. Delete this product card. The system will ask the user to reconfirm this action. Display the inventory level of this product. The inventory is updated according to the Stock Entries tab of the Bookkeeping Module. 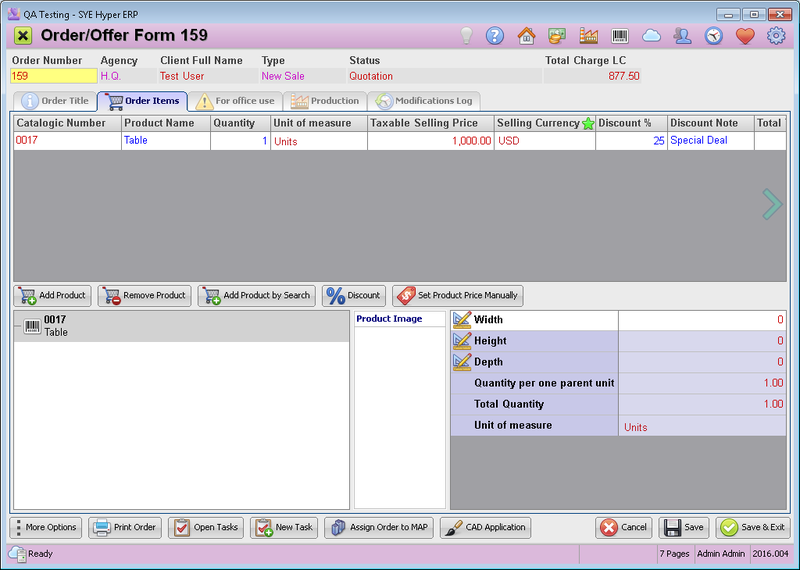 This tab is used for creating the product tree for products that require assemble of other items and parts. In this area the required parts of the product are defined and the product tree is built by using Pascal. In order to build the product tree, the user must have a basic understanding of this programming language. The system allows to use the defined buttons, for common functions and commands. This tab is used for defining the list of available suppliers for this product. The table displays the suppliers of this product and allows to choose and set the default supplier for it. Add a new supplier record to the table (Ctrl+Enter). In the "Supplier Name" field, select the required supplier from the suppliers list. Valid From Date This supplier price offer will be available from this date. Tax-Free Cost Price The supplier's tax-free cost price. This price will be automatically filled in the "Tax Free Cost Price" field of the "Product Card" tab. Taxable Cost Price The supplier's taxable cost price (the tax is not included). this price will be automatically filled in the "Tax Free Cost Price" field, of the "Product Card" tab. Press the symbol to deduct the tax from the cost price. Cost Currency The required currency of the supplier's cost price. Last Updated / Updated by These fields are automatically filled in by the system. Select the preferred supplier from the list, for this product. Press the Set as Default button to define this supplier as preferred. When ordering this product, the cost price will be automatically taken from this supplier. Hyper allows its users to create a customized campaign for each product. Campaign Name Campaign Name / Description, as will be displayed while making an order for this product. Discount % The suggested discount for the product. Valid From / Till Date Define the time frame from the campaign. Valid From / Till Hour The campaign will be available in each day and for this time frame only. Available to Customer Clubs Limit the campaign for selected customer clubs only. Please note - the special product price of the campaign will be valid for the defined period of time only. When adding the product to a new order, the special price will be automatically updated in the product record.